by James Slater – Tonight in Norwich, UK, unbeaten and highly touted British heavyweight prospect Tyson Fury made short work of 35-year-old Daniel Peret, the Russian-born Norwegian resident. Stopped after the conclusion of the 2nd round due to a bad cut above his left eye, the burly veteran protested angrily, but the referee Ken Curtis had made up his mind. In improving to 3-0(3), 20-year-old Fury became the first Brit to stop the usually durable fighter nicknamed “Shrek,” who fell to 15-21(6). Barrelling out in a somewhat crude manner, the flabby-looking Peret gave it a go in the opener, but his rushes were nothing to trouble the vastly taller and faster man. Fury, with both hands held very low, fired out good left jabs followed by fast combos to both head and body. A couple of desperate charges by Peret aside, it was all Fury in the 1st. Digging some more hard shots to the older man’s ample midsection in the 2nd, the 20-year-old was picking his spots well enough. 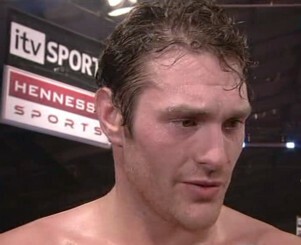 In no great rush and content to take his time, Fury really began to hurt the Russian. Somewhere amongst the barrage of hurtful shots that got through flush and had him in trouble, Peret was cut above his left eye. A final left hand to the body took further steam out of the 35-year-old just before the bell rang to end the round. The cut was deemed too bad for Peret to come out for the second, and the visitor was fuming – screaming out, “No! Are you crazy!” There was no way, however, that Peret would have survived had the fight been permitted to go on, cut or no cut, as he was taking way too many clean shots and had no way near enough power or speed of his own to get into the bout in a serious way. In his last visit to the UK Peret managed to take another prospect, Derek Chisora, the full eight rounds – tonight he was not as fortunate. Fury, who has already attracted lots of fan attention, looked in better shape than in his last fight, and slowly but surely his physique is getting firmer and more chiselled. As commentator Barry McGuigan said, though, Fury is not a fighter who will ever be a body beautiful type. Fury said after the fight that he feels he is being avoided and that he would like “just one” British fighter to come out and show willing and face him in his next fight, scheduled for March 14th. Let’s see if one comes forward. Next post: Juan Manuel Marquez – Juan Diaz: Keys to victory, 4 to explore, official prediction!